A16B-2201-0103 Available Versions: #R /02A, /10B, /09A Ect. Technical Tip: Last digit of the part number may be missing A16B-2201-010 call we can help you identify the right board you need. 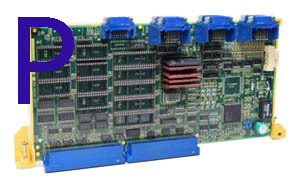 The FANUC A16B-2201-0103 Memory PCB control board is from 32 bit OMC and OTC also OTD and OMD Series CNC Controls. We can offer same day exchange service also in-house Fanuc UK repair service and testing on this Fanuc memory control board without serial interface fibre optic connection for the Fanuc Alpha or digital AC servos. This board is from the O series the best selling Fanuc CNC made production ended 2002 now replaced buy the current OI Series. We have a growing inventory of over 35,000 FANUC parts in stock ready for immediate worldwide delivery. By utilizing our services, you can save up to 60% off OEM prices. Request a quote today and one of our FANUC UK customer service team will assist you. ©2018. We are not Affiliated with any FANUC CNC or FANUC UK or Fanuc CNC UK Ltd Companies.